This cake is moist and fun to make! 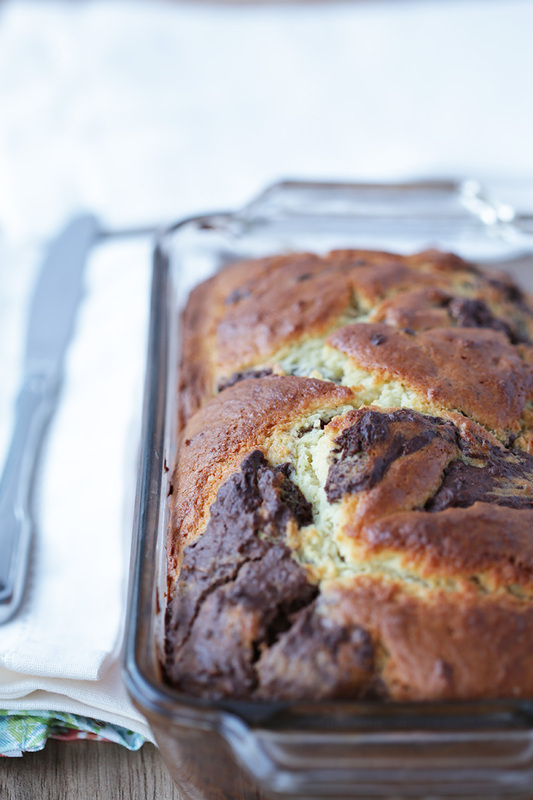 My husband Brian and I loved the way this marble cake from Martha Stewart looked, but we didn’t love the idea of adding the buttermilk it required. So he suggested substituting it with low fat plain Greek yogurt, which turned out to be a great idea. I think the yogurt made the batter thicker and it reduced the fat content by a lot. The resulting loaf is sweet, but not too sweet (as marble loaves from supermarket bakeries can be). We find that the easiest way to do it is with a butter knife. You drag it back and forth in a continuous S-shaped motion. Because it uses cocoa powder, the chocolate cake part is a bit bitter, which my 14-year-old daughter loves because she loves dark chocolate. Personally I prefer semi-sweet or milk chocolate in general, so I’d add another 2 tablespoons of sugar, or serve it with a dollop of vanilla ice cream or whipped cream. Butter a 9-by-5-inch loaf pan. Whisk the cake flour, baking powder, and salt together. Set aside. Beat the butter and sugar until it’s light and fluffy, about 3 minutes. Add the eggs, beating each one, and the vanilla. Add half the flour mixture; beat. Add half the yogurt; beat. Set aside 1/2 of this vanilla cake batter. In a mixing bowl combine the cocoa and 1/4 cup plus 2 tablespoons of boiling water; mix with a spatula until it’s smooth. 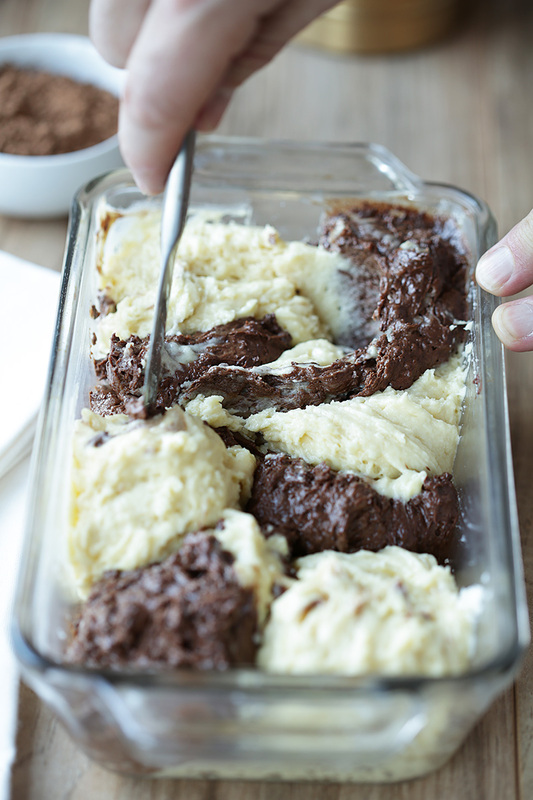 Add the cocoa batter to 1/2 of the vanilla cake batter and stir until it’s combined. 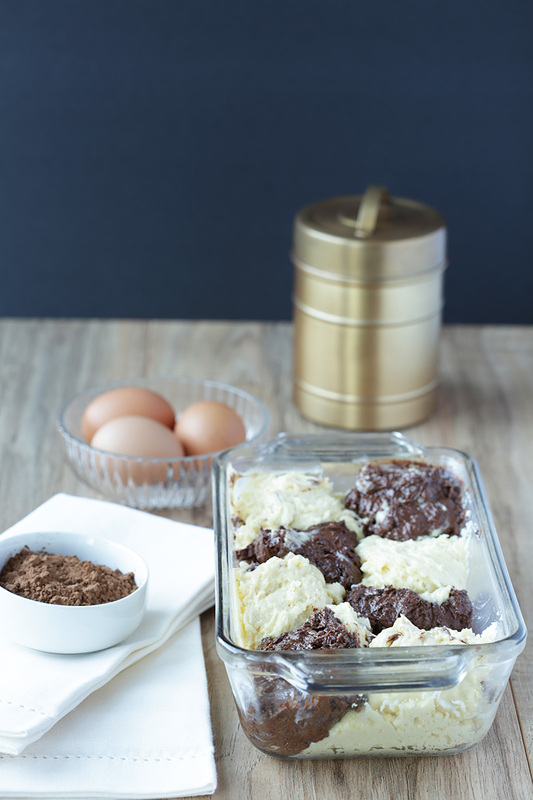 Using a large spoon, create a checkerboard pattern by alternating dollops of the yellow cake batter with the dollops of the chocolate cake batter. Take a butter knife and run it through the batter from one end of the pan to the other, moving left to right, to create an S-shaped swirl. Bake for 20 minutes and rotate the pan. Bake for another 20 to 23 minutes, or until a toothpick comes out fairly clean. Cool it in the pan for five minutes to finish cooking, then transfer to a rack. Have you tried making this recipe? Let me know what you think!